Congratulations to all 953 people who ran, jogged and walked three laps of the Tooting Triangle on Saturday, you’re all record breakers! Just a few days ago Jasmine wondered, in the last run report of 2018, whether 2019 would see Tooting’s attendance record of 817 broken. Well it didn’t take long. 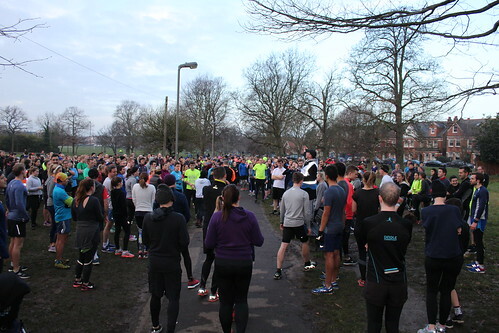 With the help of 166 first timers at Tooting, 97 of whom were possibly putting New Year resolutions into action and running their first ever parkrun. 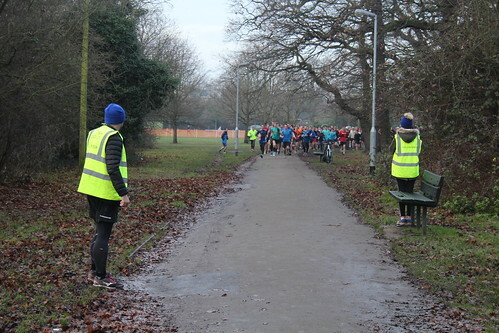 It meant Tooting was the third biggest parkrun in the UK on Saturday, with only Southampton (1,062) and Bushy Park (1,505) seeing a larger turnout. 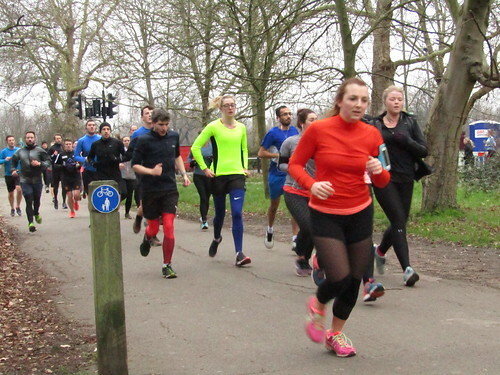 All of whom were part of parkrun’s highest ever total turnout, over 340,000 participants. So you’re not just record breakers, you’re double record breakers! We hope you all enjoyed it and will come back soon. It’s amazing to think that it all started less than 15 years ago with just 13 people in Bushy Park, and even five years ago the total turnout at the start of 2014 was 40,000 parkrunners. And it wasn’t just Tooting that broke attendance records on the first Saturday of 2019. Over 70 new attendance records were set around the country. Our near neighbours Clapham Common were almost as busy, with 871 people taking part, making them the sixth busiest in the UK. Still a little way to go before we match the world’s biggest parkrun, North Beach, Durban, South Africa, with a record attendance of 2,527 set in January 2018. They must have a really big funnel. Of course not all parkruns are that busy. If you want to get away from the crowds then Bickershaw parkrun, near Wigan, had just two participants on Saturday, who were outnumbered by the three volunteers. It may be the smallest parkrun in the country, but then you need an invitation from Her Majesty to be able to take part, as the course is completely within the grounds of a closed prison. One person who didn’t need to queue to pick up their finish token was Jeff Cunningham of Herne Hill Harriers, who was the first finisher in 17:05. The last time he was first across the line at Tooting was run number 75 back in 2017. The second man in didn’t have his barcode, so will remain anonymous, whilst the third finisher was Luke Pikett in 17:50, who must enjoy starting the year with a few laps of the Tooting Triangle, as he was the first finisher twelve months ago on the first Saturday of 2018. Jordan Foster of Nene Valley Harriers, completing her 54th parkrun, and her fourth at Tooting, in 18:21, was the first woman to finish. Her time was a new Tooting PB for her, and with an age grading of 80.65% meant she also topped the age grade table ahead of Jeff Cunningham (77.66%) and Stefan Klasener (77.36%). Phoebe Heinrich of Clapham Runners, was the second woman in 21:17, in her first ever parkrun, and third woman was Sophie Wiles of Epsom Oddballs (a running club for all ages, shapes and sizes – now that’s a club I’d fit right in), finishing her 65th parkrun, and her first at Tooting, in 21:42. 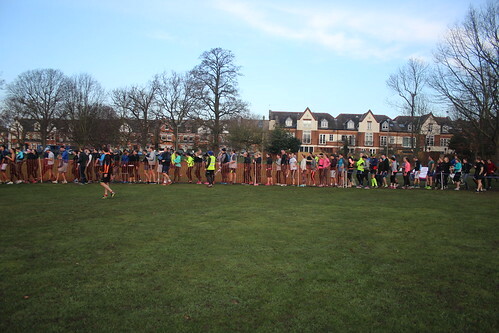 Amongst the Juniors, Esme Freeman was the first Junior Woman in 24:50, just three seconds in front of the second Junior Woman, Georgina Waight, who’s well on her way to claiming her 50 milestone shirt in 2019, have already completed 41 parkruns. There were also some amazing Junior PBs. 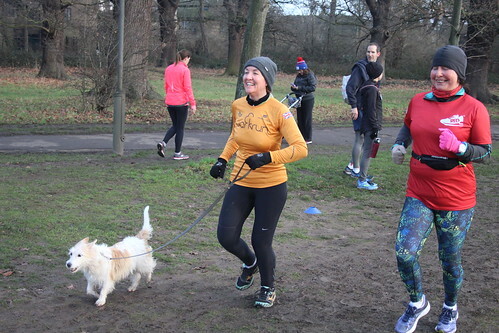 Isobel Burghes was over three and a half minutes faster than her last parkrun back in 2017, with a new PB of 25:10, Mabel McCarthy improved her PB from last November by over four minutes, finishing in 26:40, and Ella Pal set a new Tooting PB of 26:44 on her 110th full parkrun (she’s also done 118 junior parkruns!). Dylan Sweet was the first Junior Male to finish, once again dipping under 20 minutes, with a time of 19:58, on his 80th parkrun, whilst JM10 Freddie Hake exactly matched his time from before Christmas, with another 21:38, putting him sixth on the overall age gradings with 72.96%. Jacob Dilley improved his PB by over two minutes, finishing in 25:27, as he completed his 10th parkrun. Which means Jacob can now claim his white junior milestone shirt, along with Julian Sakrouge, who also finished his 10th parkrun on Saturday. There’s also a black 100th parkrun top waiting for Orla McLarnon who reached that milestone on Saturday, and just missed out on a new PB at the same time, running her second fastest ever time at Tooting. 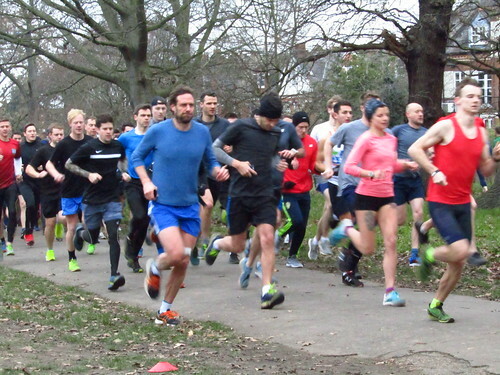 Whilst Adam Walker completed his 200th parkrun, in a new Tooting PB of 18:36. Just 50 to go for his 250 milestone top. The 99th parkrun at Tooting Common was a fairly muddy affair. 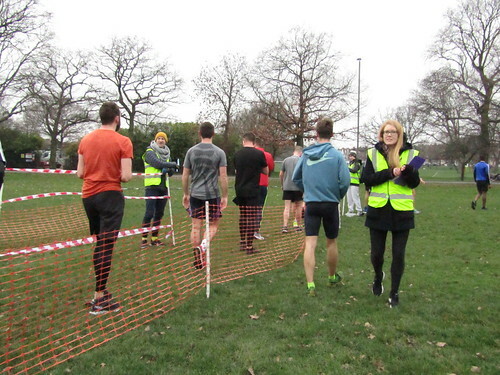 It was the first regular event of the year and my first parkrun in several months. My attendance was part of a New Year’s resolution to get back into regular running and it would appear a few other people had the same idea. For me, the best way to make sure that I keep up with regular exercise is to set myself some challenges to aim for. I’m not a natural runner, and although I generally enjoy it I’ve always struggled to make any improvements on time or distance. Having some events to aim for always encourages me to keep at it. Two years ago it was a summer of Cancer Research Race for Life 5k races ending with a Race for Life 40k Hike in the Peak District, and last year I stepped it up a bit by taking part in my first triathlon. Although I had that initial ‘What are you doing?! ?’ moment as I walked into the Thames at Victoria Docks, I actually really enjoyed it. And the great thing about trying something new is that you always get a PB! In fact, I think I’ve got the tri bug because I followed it up with another one later in the year in the beautiful surroundings of Hever Castle, and although I found it tough pushing myself in a slightly longer distance (and up some fairly hideous hills) I still really enjoyed it. So this year my focus will be on preparing for a few more triathlons, my first being in June. Regularly turning up for parkrun is definitely going to play a big role in this so let’s see if I can keep up my New Year’s resolution and make it to every week. And let's see how many others do too. Now on to stats. 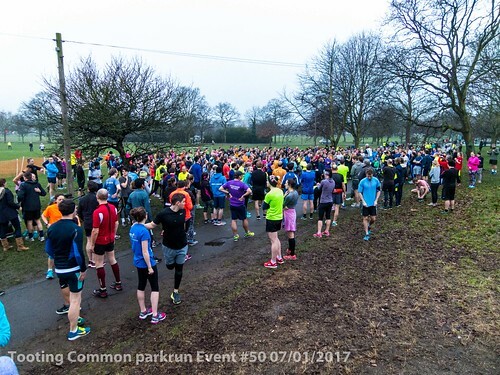 This week we had 123 people running their first ever parkrun, 188 first timers at Tooting Common and a total field of 812 people. Well done to Luke PIKETT (SM30-34, Clapham Chasers RC), Jeff CUNNINGHAM (VM35-39, Herne Hill Harriers) and Nick BESTER (SM25-29, Boksburg AC) who were the first 3 males over the line in 16:59, 17:16 and 17:23 respectively. And Alexandra MCCLELLAND (SW25-29, Warwick University AC), Lois HOLLMAN (SW20-24) and Claire COOPLAND (SW30-34, Clapham Chasers RC) were the first 3 females to finish in 21:21, 21:48 and 21:50. Shout outs to Helen SLATER, who ran her 50th parkrun with us today, and junior runners Tobey TURL and Georgina WAIGHT, who both completed their tenth parkrun and are eligible for the white junior milestone shirt. And a very Happy Birthday to William TURVILL, whose gift to himself was finishing in 26:33 - 3 seconds off his course PB! There were a total of 39 PBs recorded today, with the best improvement of the week going to Ava HUDSON who got round the course in an amazing 3 mins 23 seconds quicker than her last PB in June of last year. Her new PB is exactly 38 mins. Jonathan PACE also achieved his first PB since July last year, improving by 54 seconds to 23:47. Richard WILLERS and Shaun O'GARA both went sub 23 in their second Tooting parkrun of the year, improving on their Monday runs to 22:49 and 22:57 respectively. 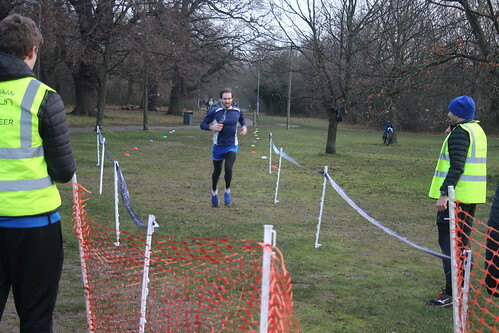 And Bruce MOXHAM recorded his fourth successive Tooting Common parkrun PB, improving this time by 2 seconds to 26:47. Finally, a big thank you to the 30 volunteers who made the event possible: Tom BAKER, Craig BARNEY, Cecilia BOGLE, Ross BROWN, Malcolm CAMMACK, Jehan-Zeb CHESTER, Robert DUNBAR, Ian ELLWOOD, Oliver GREEN, George GUEST, Stephanie HELLINGS, Thomas JEFFERSON, Ben JONES, Cal JONES, Harriet KENNEDY, Stan LAMBERT, Simon James LEWIS, Yvette LEWIS, Paula LUESHING, Catriona MACARTHUR, Carol MCCALL, Evie NOSWORTHY, Nandor ORBAN, Michael RYAN, Mark SHOTTON, Dylan SIMPSON, Nellie PERRIN, Rosie WARD, Ken WILLIS and Rob WOODWARD. Without volunteers the event can’t take place and the great thing is that there are several roles that allow you to still take part in the run (including writing this report). Have a look at the volunteer pages to see descriptions of the roles available and where there are gaps over the next few weeks. 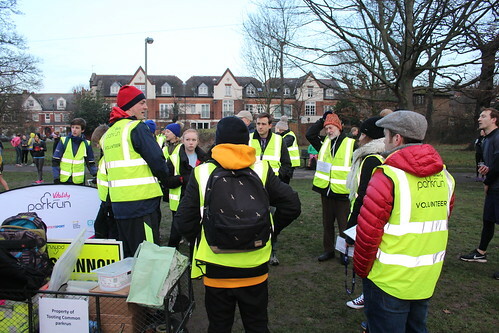 You can always email tootingcommonhelpers@parkrun.com if you have any questions. 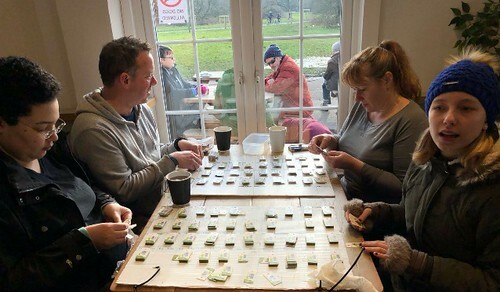 And if you’ve ever wondered how long it takes to sort 800 odd finishing tokens back into order, it’s about an hour and 15 minutes! 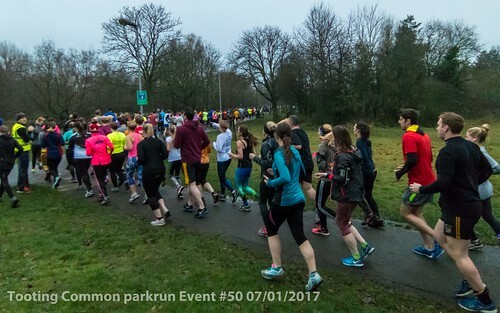 It was a morning where 122,000 like-minded athletes at 9am (9.30 in Scotland) in unison across the UK began their 5K run including 1421 parkrun debutants to create the parkrun UK attendance record. 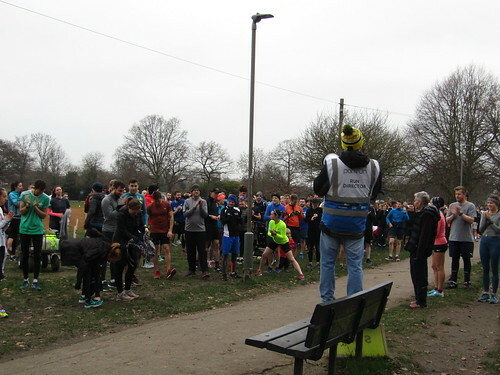 Welcome record breakers whether you were one of the new registrants, debutant, a tooting common parkrun regular or your name was Dave John Williamson, a parkrun tourist from Leeds who ran his 386th parkrun with us. Dave then stepped in to help with management of the funnel and helped with the close of the event. You're a star, Dave! 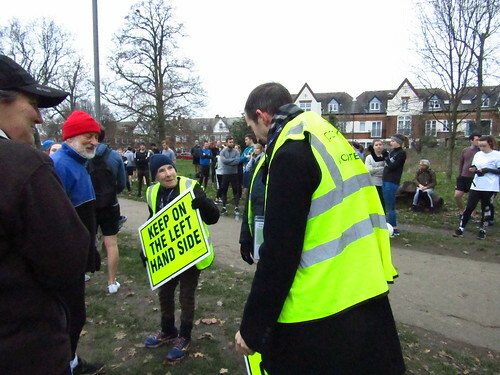 Well done to Nick Broker, who marshalled with us on both New Year's Eve and New Year's Day but ran with us today to complete his 50th parkrun via Bristol in the west to Tooting in the east, and a detour to Edinburgh and Sweden. Don't forget to claim your red shirt, Nick! Well done also to Stephen Carey, who completed his 100th parkun. From Aberdeen in the North to Hastings in the south and various London courses in between. A black shirt awaits you, Stephen! One further well done to Ken Willis who volunteered with parkrun for the 25th time today. A purple shirt awaits you, Ken!